Any mods or plans done to either? I loves me some Formula. I'm guessing all mods go to the F-body, and not the G6? The G6 is completely stock besides some Alpine component speakers. The formula on the other hand has come a loooong way, haha. Let's see... I got it in May of 2005, it was pretty rough looking. I replaced the stock hood with the firehawk hood and had the car repainted, added the gunmetal ZR1 wheels, got new tail lights, changed the cd player, speakers and added a stealth mount sub. It just got a brand new lt1 crate motor straight from the factory... Other mods include... Mezierre electric water pump, K&N Cold Air Intake, BMR rear lower control arms, Hotckis adjustable panhard rod, Pacesetter Long Tube headers and off road y pipe, Ravin muffler and I'm sure I'm forgetting something! 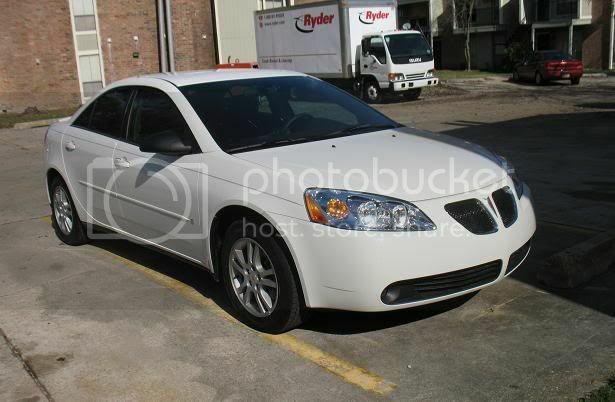 Soon to be added will be new window tint, brand new carpet and some Black collectors edition leather seats. Oh and the color of the formula is called Purple Pearl Metallic... It's like a gunmetalish purple, haha. nice rides you got there! Welcome to the site! Nice cars, I like the colour on the Formula. Nice rides! welcome to the site. who reffered u to this site? Me and Ghost are some kool people to know. Gotta love Pontiac Your so welcome to this club its the funnest and koolest. why are you using that? Nice Pontiacs, I have an 06 GTP white like yours. Goood morning everyone! Well, here it goes! Howdee Kristen! I'm the resident flirt.......lucky for me, I know you're going to be a super hottie, cause every woman I know named Kristen, is!! !.........Yeah, super hottie! so since you're Pre-Certified, WELCOME TO OUR HUMBLE CORNER OF THE NET! Here's a link you're sure to enjoy, too! Ok for the life of me I can't find the gosh darn post a picture of yourself link on this site! I did a search for the thread, nothing...........Is there even a post a picture of yourself thread???? Oh well, Kristen! If you need anything, just ask.......well, almost anything! what took you so long BAMBAMM? Sometimes being the first to jump onto a new member isn't the best way to make yourself known. Plus, what if we have a "Stacy" on our hands, I wouldn't want to be the first one to welcome anyway! Crossing my fingers Kristen isn't a Stacy!